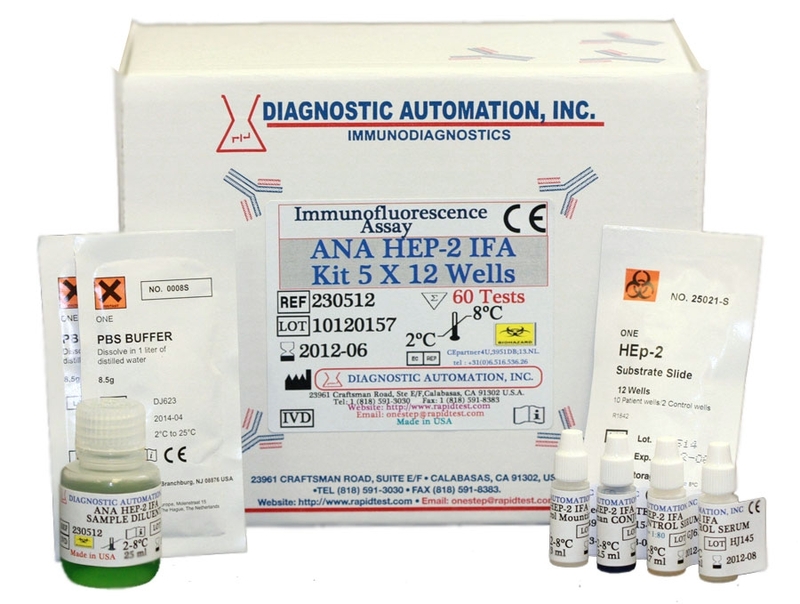 The Diagnostic Automation, Inc. ANA/HEp-2 Test System is a prestandardized kit designed to detect the presence of circulating ANA in human sera. The system employs tissue cell culture substrate and goat anti-human immunoglobulin adjusted for optimum use and free of nonspecific background staining. The reaction occurs in two steps; (1)The first is the interaction of ANA in patient sera with the cell culture substrate. (2)The second is the interaction of FITC labeled anti-human immunoglobulin with antibodies attached to the cell substrate in step one. Only freshly drawn and properly stored blood sera obtained by approved aseptic venipuncture procedures should be used in this assay (32,33). No anticoagulants or preservatives should be added. Avoid using hemolyzed, lipemic, or bacterially contaminated sera. Store sample at room temperature for no longer than 8 hours. If testing is not performed within 8 hours, sera may be stored at 2-10ï¿½ï¿½ C for no longer than 48 hours. If delay in testing is anticipated, store test sera at -20ï¿½ï¿½C or lower. Avoid multiple freeze/thaw cycles which may cause loss of antibody activity and give erroneous results.